Propagation of odontogenic masticator space abscesses is insufficiently understood. The purpose was to analyse pathways of spread in 30 patients with odontogenic masticator space abscess. 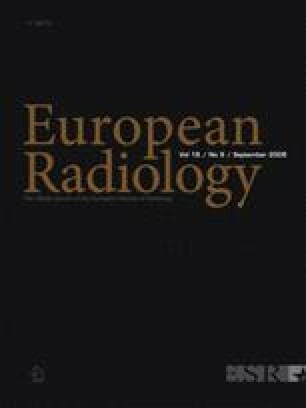 The imaging findings in 30 patients (CT in 30, MR in 16 patients) were retrospectively analysed. CT and MR imaging depicted a masticator space abscess within: medial pterygoid muscle in 13 patients (43.3%), lateral masseter and/or pterygoid muscle in 14 (46.7%) and superficial temporal muscle in 3 patients (10%). In the lateral masticator space intra-spatial abscess extension occurred in 7 of 14 patients (50%). The sub-masseteric space provided a pathway in seven (70%). Extra-spatial extension involved the submandibular space only in 3 of 14 patients (21.4%). Medial masticator space abscesses exhibited extra-spatial spread only. Extension affected the parapharyngeal space and/or soft palate in 7 of 13 lesions (53.8%). MR imaging in comparison to CT increased the number of abscess locations from 18 to 23 (27.8%) and regions affected by a cellular infiltrate from 12 to 16 (33.3%). The sub-masseteric space served as a previously underestimated pathway for intra-spatial propagation of lateral masticator abscesses. Medial masticator space abscesses tend to display early extra-spatial parapharyngeal space and/or soft palate extension.